Most automotive engines are "water"-cooled to remove waste heat, although the "water" is actually antifreeze/water mixture and not plain water. The term engine coolant is widely used in the automotive industry, which covers its primary function of convective heat transfer for internal combustion engines. When used in an automotive context, corrosion inhibitors are added to help protect vehicles' radiators, which often contain a range of electrochemically incompatible metals (aluminum, cast iron, copper, brass, solder, et cetera). Water pump seal lubricant is also added. Antifreeze was developed to overcome the shortcomings of water as a heat transfer fluid. In some engines freeze plugs (engine block expansion plugs) are placed in areas of the engine block where coolant flows in order to protect the engine from freeze damage if the ambient temperature drops below the freezing point of the antifreeze/water mixture. These should not be confused with core plugs, whose purpose is to allow removal of sand used in the casting process of engine blocks (core plugs will be pushed out if the coolant freezes, though). On the other hand, if the engine coolant gets too hot, it might boil while inside the engine, causing voids (pockets of steam), leading to localized hot spots and the catastrophic failure of the engine. If plain water were to be used as an engine coolant, it would promote galvanic corrosion. Proper engine coolant and a pressurized coolant system can help obviate the problems which make plain water incompatible with automotive engines. With proper antifreeze a wide temperature range can be tolerated by the engine coolant, such as −34 °F (−37 °C) to +265 °F (129 °C) for 50% (by volume) propylene glycol diluted with water and a 15 psi pressurized coolant system. Early engine coolant antifreeze was methanol (methyl alcohol), still used in windshield washer fluid. 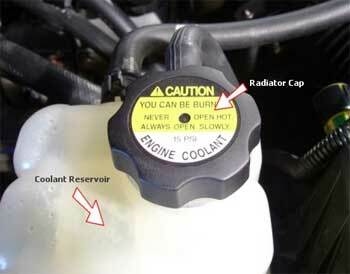 As radiator caps were vented, not sealed, the methanol was lost to evaporation, requiring frequent replenishment to avoid freezing of the coolant. Methanol also accelerates corrosion of the metals, especially aluminium, used in the engine and cooling systems. Ethylene glycol was developed, and soon replaced methanol as an engine cooling system antifreeze. It has a very low volatility compared to methanol and to water. Let Dana Brothers Automotive check your levels and make sure your engine is cooling the way it should.